Historical Development: Katsina was one of the prejihad hausa city states which was conquered and annexed into the Sokoto caliphate by Mallam Urnmarun Dallaji in the early part of the 19th Century. 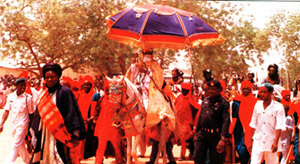 After the British colonial conquest in 1903, the erstwhile Katsina and Daura emirates became Katsina Province of the former Northern region of Nigeria. Later, Katsina and Zaria Provinces together formed the North Central State under the Gowon regime's twelvestate structure. North Central State was left intact in 1976 when the number of states were increased to nineteen under the new name of Kaduna State. Katsina State came into existence on the 23rd of September, 1987 covering the same area of the former Katsina Province of the defunct Northern Region. Its creation along with Akwa lbom State, raised the number of states from nineteen to twen tyone under the then Babangida military administration. Thence forth, the agitation for the creation of Katsina State, which dated back to over a decade under an umbrella organisation called the Movement for the Creation of Katsina State, came to rest. (Udo and Mamman, 1993). Administrative Structure: Three tiers of gov ernment exist in the state namely; executive, legislature and judiciary. The executive arm is administered through the State Executive council which is headed by the governor. The current Governor being Alhaji Umar Musa 'Yar'Adua (the younger brother of late General Shehu Musa Yar'Adua of blessed memory), democratically elected on the platform of the Peoples Democratic Party (PDP). Other members of the Executive Council include the Commissioners (who head ministries); various parastatals are either under the office of the gover nor, or other related ministries. The legislature is headed by the Speaker of the state House of Assembly, his deputy, chief whip, majority and minority leaders; a registrar of the house serves as the Secretary and head of the non legislative officers. The judiciary is headed by the Chief Judge. Local Government Structures: Each local government has two tiers; the executive and the leaislature. The executive wind is headed by the Chairman, others include the officers heading various departments and a secretary. The legislative arm is made up of the Speaker, his deputy and eight councillors. Indigenous Structure: This is headed by the Katsina and Daura Emirate Councils which are headed by the Emirs. Each emirate is subdivided into districts, which are headed by district heads (hakirnai). Each district is also made up of villages headed by village heads (or dagatai). Further, towns wards and hamlets are headed by the Masu anguwa or ward/hamlet heads.